We have come to the end of our FA People’s Cup coverage. What a weekend it has been. Thank you to all those who have got involved and to all our reporters who have braved the cold out there to bring you the action. Fear not, it is just 22 days or 528 hours until the Grand Final in Sheffield and we’ll be right back here to bring you all the action. In the meantime, don't forget to tune in to our highlights show on the Red Button and BBC Sport website from 18:40 GMT on Saturday, 5 March. Here's a 15-year-old goalkeepers kit from the Tanned United in Manchester. And here's the son of Canaries Vets goalkeeper dreaming of being like his dad one day. Athletico Aboyne have been competing in London today in the Male veterans category. Good luck in your final games! No matter whether you've won or lost, it's important to remember the handshakes at the end of the games, as Grange Academy and Saints Foundation showed earlier. If at first you don't succeed.....Armley CCFC Legends score v Bedlington Vets in Manchester. Practical matters are at the forefront of the Hornsea 3G team's minds when their goalkeeper is struggling with a hand injury. "He's got to drive us home," they shout. Manjinder on email: Which five-a-side team has been playing for the longest amount of time and still has some original members? Harehills Place FC, based in Leeds, have been going since 1983 and we have one original member yet (complete with his zimmer frame!) That is 33 years!! Who can beat that? There's a question for you all out there, can you beat 33 years? This is Shane - aka 'Banana Man' - being true to his team's name, the Chilli Banana Legends, who are playing in the Male Veterans category in Manchester. The side have lost both of their first two games but are still in high spirits. Some of the other peculiar names in their category include Old Monkey FC, Murder on Zidane's floor (not to be confused with Murder on Zidance Floor from Saturday), Beercelona, Toilet FC and AC alittlesillouetteofaman. Our camera crews have been out and about all weekend filming the action for our FA People's Cup regional semi-final highlights show. You can watch the programme, which will bring you the best stories, goals and moments from the weekend on Saturday, 5 March from 18:40 GMT on the Red Button and BBC Sport website. These lucky teams got a chance to take a picture with the FA Cup while it was in Luton. Have you spotted the FA Cup on it's travels this weekend? If so send us your pictures. Hornsea 3G's Walking Football goalkeeper denies Preston North End Senior Whites FC in Manchester. This is Karl who plays for Portsmouth Amputees (who won in the Adult Disability category in Portsmouth today). He's a prosthetic technician in real life and encourages patients to play football. You'll be able to see more about Karl and the Portsmouth Amputees in our semi-final highlights programme on the red button next Saturday, 5 March at 18:25 GMT. 2015 finalists Tuttle United have again made it to the semi-final stage in the Male veterans category. The team is, rather harshly, named after someone who didn’t make the team and was formed in 1990! Head teacher Mark Partridge captains the side which also features another teacher, tennis coach, finance worker and RNLI worker. Good luck to the team, school kids across the country are currently wishing their head teacher was as cool as Mr Partridge. Love Machine just let a goal in! Anguish for the Yorkshire Vets goalkeeper in the Adult Veterans category in Manchester. When Men's veterans team 300 Club were set up around the year 2000, the club name was the combined ages of the eight playing members. Since then the players (and ages!) have changed a little, but five of the original members still remain and will compete in London today. 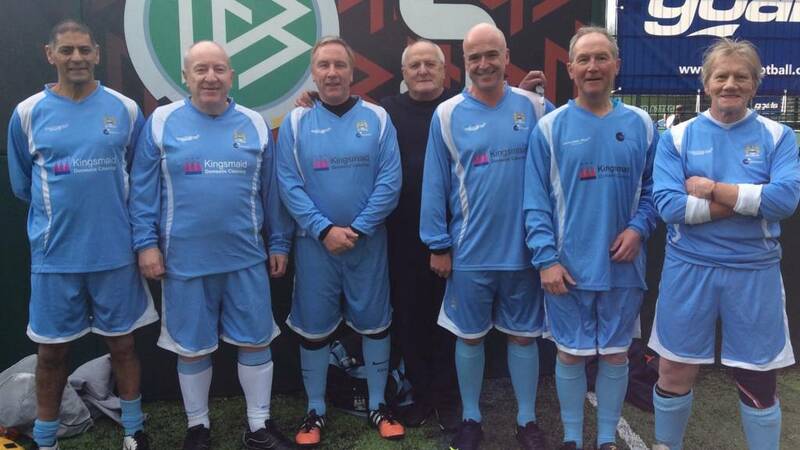 Blue Moon Walkers have won their first game in the Walking Football category.